Africa is bidding to host the world's most powerful radio telescope, the Square Kilometre Array (SKA). When constructed, in 2025, it will have 50 times greater sensitivity than any other radio telescope on Earth. The SKA will probe the edges of our universe, even before the first stars and galaxies that formed after the Big Bang. This telescope will contribute to answering fundamental questions in astronomy, physics and cosmology, including the nature of dark energy and dark matter. South Africa is leading the African bid and has already legislated to create 12.5 million hectares of protected area - or radio astronomy reserve. 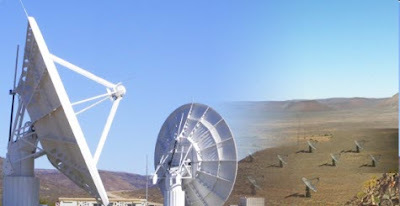 This area is also referred to as the Karoo Central Astronomy Advantage Area, offering low levels of radio frequency interference, very little light pollution, basic infrastructure of roads, electricity and communication. The human story began in Africa and it can also be the place where we find answers to the story of our universe. For more information check out http://skaafrica.com/. I found this blog really informative and helpful for me. May not to others for me this blog is really important. Thanks. Great news for the African continent lets hope it benefit them finacially. Well done Congrats with your award. Its a very nice news.I have very much interest in astronomy.These telescopes will help us to get more information regarding our galaxy.I like to watch them in Discovery channel.We came to know about lot of topics which were taught in our school days but that time the concept was not that much clear for us. Please, keep up the excellent work and continue to post topics like this. I am really fan of your blog.